I'LL STAY (January 2018, Kensington Books). When 22-year-old Clare Michaels travels on spring break with friends- including her best friend, the dynamic and intense Lee- she has no idea how fateful this trip will be. But a few bad decisions lead Clare and Lee into a horrific encounter with three violent men. When Lee sacrifices herself so Clare can escape, the decision sets the novel in motion. Told in three parts, and set in Indiana and on the East Coast, the novel addresses the ramifications of this night during different stages in their young adult lives. Clare wants to believe that she's "moved on." If she's a good person and takes care of Lee's emotional life- just as she's been taking care of her troubled yet brilliant mother- she'll be forgiven for leaving that night. But Lee- who flounders after the trauma, can't forget. As the years go by, the events of the night keep dragging them back into it and threaten not only their friendship but also their self worth. Along the way, the novel wrestles with important questions: how much do we owe the people we love? What are the dangers of living an unexamined life? And how can we escape the psychological paradigms established in our childhoods? A MILLION MILES FROM BOSTON (April 2011, Wendy Lamb Books/Random House) tells the story of 12-year-old Lucy Gallagher, who lives in Boston with her Dad, brother and beloved dog, Superior. It's been a rough school year, with an annoying boy and Dad's new girlfriend in the picture. Lucy can't wait to get to Maine, where she spends summers at her family's cottage. Where she feels most like herself. But on her first day, Lucy's summer is turned upside down with the arrival of a new family. Could the summer get worse? It does. But Lucy learns a valuable lesson. That people aren't often what they seem. "Day captures childhood's pain and hope deftly in this satisfying tale." "Day has written a great book that deals with a variety of believable interpersonal relationships and transitions. Lucy is a sweet girl who is trying to do the right things, while juggling the confusing world of tweendom." NO CREAM PUFFS (May 2008, Wendy Lamb Books/Random House) is the story of 12-year-old Madison Mitchell who becomes the first girl in Michigan to play baseball on an all-boys' little league team in the 1970s. It's a funny yet poignant look at what it was like to be a star athlete at a time when there were little sporting opportunities for girls. Not only does Madison have to worry about people who question whether she, or any girl, should be allowed to play little league, but she also has to deal with her own growing insecurities. What will her friends think about her in a uniform? Will the boy she likes still be interested if she strikes him out? What does it mean to be a trendsetter? And finally, how will she ever make sense of all of these new rules she inadvertently sets in place? "Baseball provides fertile ground for exploring cultural and personal issues in this satisfying novel set in the summer of 1980." "Every one of these first-rate recent titles for middle and high school students not only makes absorbing, sometimes pulse-pounding reading, but also invites readers to think about the value of teamwork, determination, and setting goals as tools for coping with doubts and other personal challenges…"
In my middle grade novel TALL TALES (May 2007, Wendy Lamb Books/Random House), 12-year-old Meg Summers wants to make a friend. Yet she and her family have moved once again, this time to a small town called Laketon, and the idea of walking up and introducing herself to a group of girls seems so difficult. What if they laugh? What if they aren't interested? What if they think she's boring? And so Meg begins weaving stories about herself, tall tales that make her life sound dramatic and interesting. But they also serve another purpose: to deflect any attention to her real family. Her dad is an alcoholic and prone to unpredictable binges and behavior that traumatize the family. She knows she must keep her real family a secret. Then Meg meets Grace Bennett. She's friendly and popular and interested in books, just like Meg. But how can her friendship with Grace continue to grow when Meg has kept such a big secret? What will she do now that the tall tales she told are coming back to Grace? And then Meg has another problem. What will happen at home now that her dad is drinking more and her older brother is beginning to fight back? "Honest about what it is like to live with an alcoholic parent--the cover-ups, the fear of violence, the denial--Day's first novel delivers much more than a standard problem novel; Meg's lies and secrets are funny and anguished, and readers will respond to the intense family drama and the quick, wild fantasies that Meg spins to cover up her shame." "Meg's personal emotional ordeal is well portrayed as the reader is allowed into her private confused thoughts. Day juxtaposes numerous themes and issues around two friends who live very differently, yet are burdened with powerful feelings of guilt and grief. Darkened days brighten for Meg and her family when help is finally accepted from responsible adults and a new friendship grows to a trusting and truthful relationship. Realistic, with an auspicious ending." "Day's account captures the intense tangle of emotions felt by family members who have been convinced that they are too powerless to stop abuse on their own." "Day uses the friendship between the girls and the strong adult support of Grace's family and a favorite aunt to pave the path Meg follows to trust others enough to finally tell the truth about her dad. 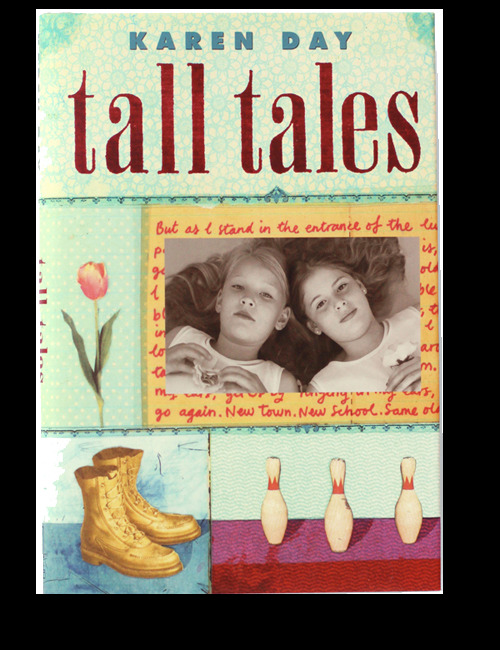 'I've been telling the biggest tall tale of my life to myself.' The author's portrayal of a family in crisis is convincingly tragic: '…it's not until mom hands him coffee that I see in his eyes how it will be today and how I should feel.' Although there is no fairy-tale ending, the story is realistic and hopeful with discussable issues appropriate for a wide audience."